Bastion: Now on Nintendo Switch! We were so excited to let you know Bastion is just a download away for your Nintendo Switch, we made this handy image! 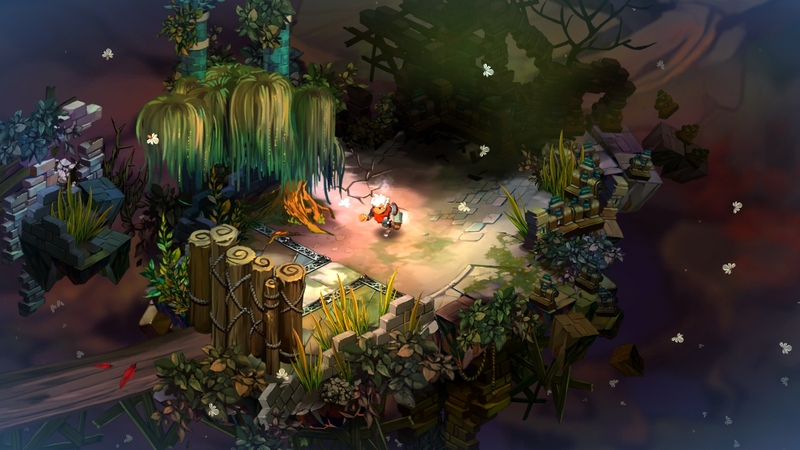 Bastion is our original action RPG set in a lush imaginative world, in which players must create and fight for civilization’s last refuge as a mysterious narrator marks their every move. To date, it's sold millions of copies worldwide and earned more than 100 industry accolades. We faithfully adapted and optimized this latest version for Nintendo's wonderful gaming console, so it's perfect for your living room or for playing on the go. The first version of the game launched waaay back in 2011, when we were still working from the living room of a house! It's been a real treat for us to revisit the world and rediscover the secrets of the Calamity after all this time, and we hope you feel much the same. And, thank you! Your support over the years has made everything possible for us. 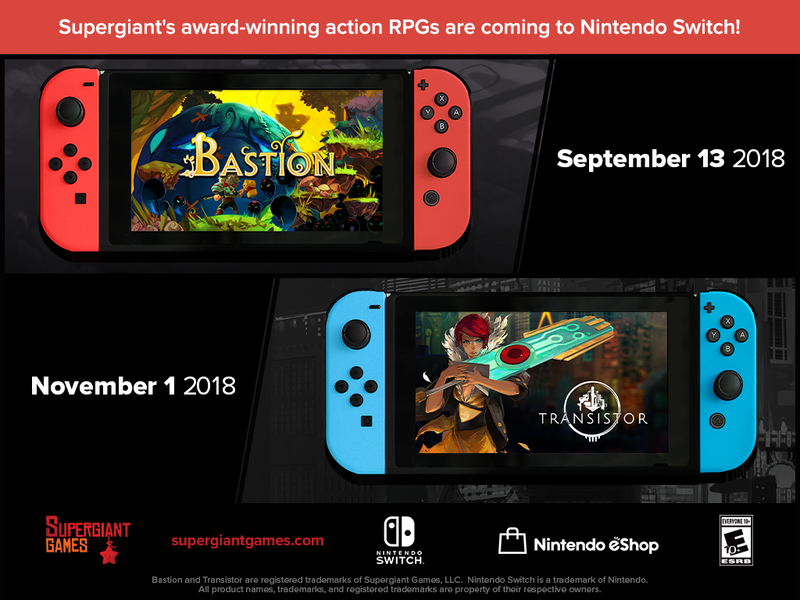 We're thrilled to announce that, by popular demand (and there has been a lot), Bastion and Transistor are coming soon to the Switch! Each title has been faithfully adapted and optimized for Nintendo's latest game console, and will soon be available on the Nintendo eShop. Play them at PAX! PAX West takes place Aug. 31 - Sep. 3 in Seattle. If you're there, visit us at booth 1520 to try both titles before they launch on the Nintendo eShop! We'll also have new Bastion and Transistor merchandise. Our debut game is an original action RPG set in a lush imaginative world, in which players must create and fight for civilization’s last refuge as a mysterious narrator marks their every move. To date, it's sold millions of copies worldwide and earned more than 100 industry awards and accolades. Bastion arrives on the Nintendo eShop on September 13, 2018 for $14.99. Our second title is a sci-fi themed action RPG that invites you to wield an extraordinary weapon of unknown origin as you fight through a stunning futuristic city. 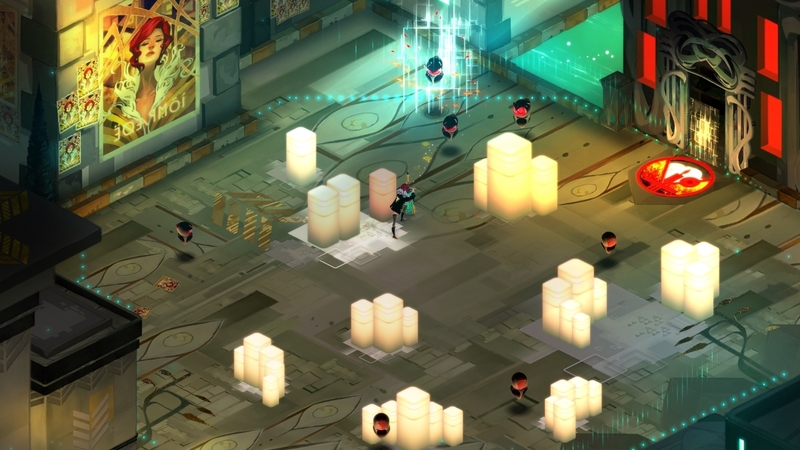 Transistor likewise was a critical and commercial hit, also earning more than 100 awards and accolades! Transistor arrives on the Nintendo eShop on November 1, 2018 for $19.99. Bastion and Transistor for the Switch mark the first time our games will be available on a Nintendo platform. Several of us from our small team grew up playing classic Nintendo game systems, dating all the way back to the Nintendo Entertainment System in the '80s, so it feels good to have finally had a chance to bring our games to Nintendo's latest and in many ways greatest console. We're grateful to our long-time collaborators at BlitWorks and Confetti for their efforts bringing over Bastion and Transistor, respectively. P.S. 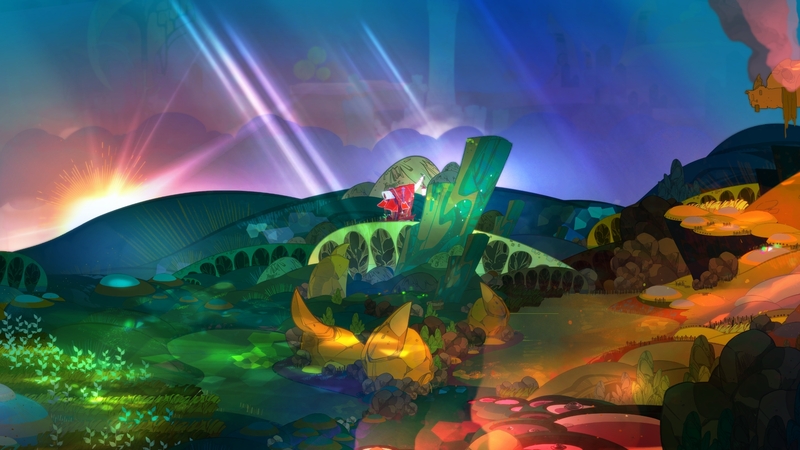 : With Bastion and Transistor coming to the Switch, you might be wondering, what about our third and latest game, Pyre? The thing is, our games are built on our own custom tech so it's not a small undertaking for us to bring them to new platforms. So, while we haven't ruled anything out for the future, currently we don't have plans to bring Pyre to other platforms. 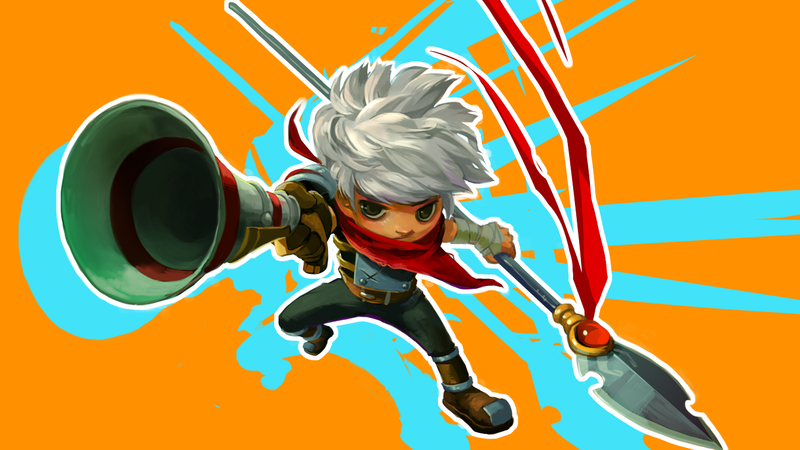 We appreciate the interest, and are looking forward to seeing the response to Bastion and Transistor on the Switch! Well this one sure took us long enough, seeing as Bastion just celebrated its seventh birthday on July 20! But, from the better-late-than-never department, we're pleased to announce this beautiful new boxed edition of our very first game! Pre-order today for the PlayStation 4 or PS Vita. This isn't the final packaging but it should be pretty close! We're grateful to the folks at Limited Run Games for collaborating with us on this latest version. The game itself is identical to what's available for download on the respective platforms -- it's the recipient of more than 100 industry awards, and to date it's sold more than 4 million copies worldwide. And now, you can have it in a physical box for posterity, complete with a brand-new, jam-packed, full-color instruction booklet we created exclusively for this release. 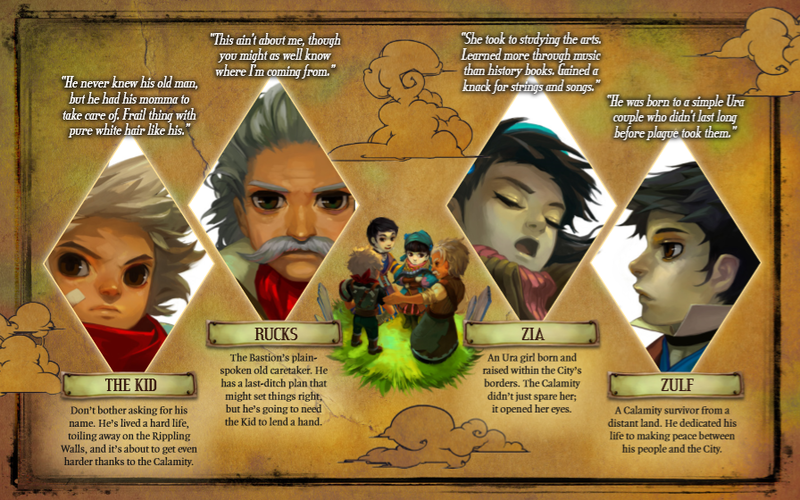 Here's an excerpt from the all-new instruction manual for Bastion. We're connoisseurs of classic game instruction manuals here at Supergiant, so it was a real pleasure to get to design one in the spirit of the booklets we grew up reading cover-to-cover. 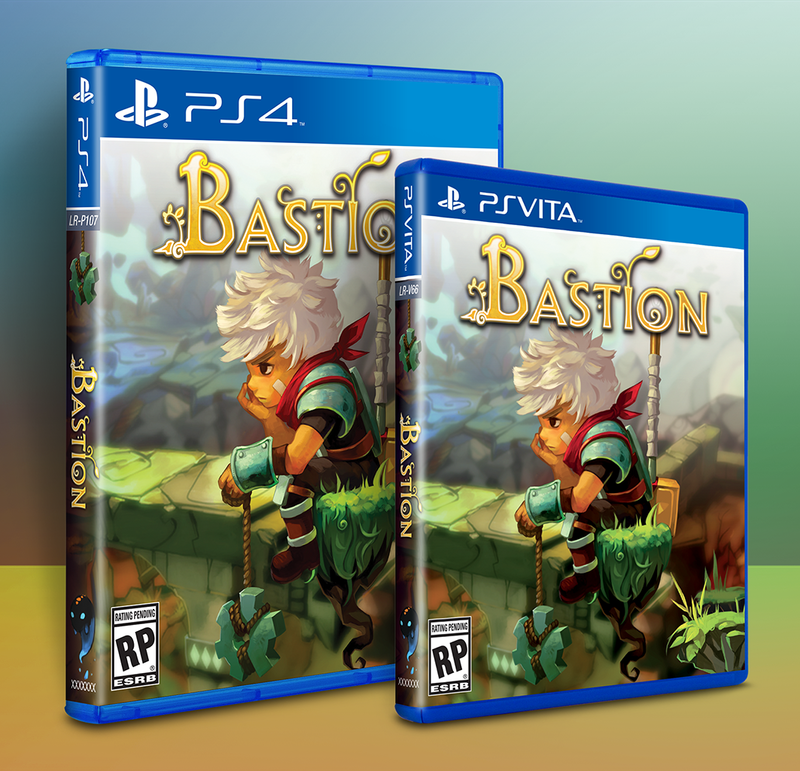 To those who've been asking us for a physical edition of Bastion over the years, thank you for all your interest and support, and we hope you love the result! And, happy seventh birthday to our first game!! Ever since our studio started back in 2009, we've mostly relied on social media such as Twitter to stay in touch with our players and keep you posted about what we're up to. 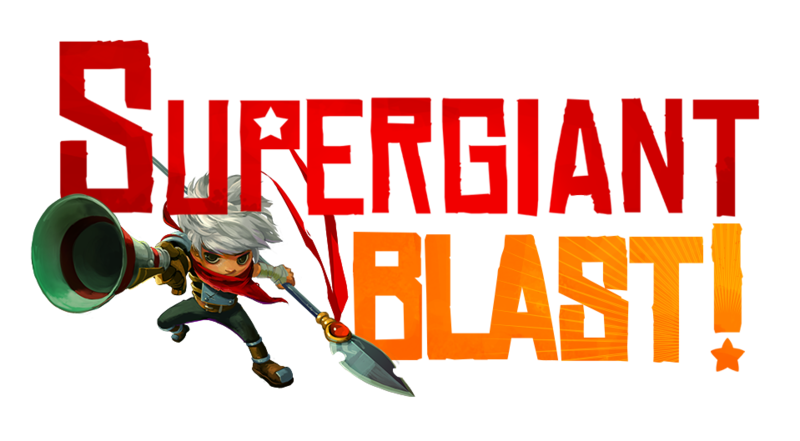 Today we'd like to let you in on a simple alternative: our mailing list, the Supergiant Blast! Sign up right here in just a few seconds. Join our mailing list and get the inside scoop on all things Supergiant! We've made limited use of an email mailing list over the years for announcements and special offers. With the Supergiant Blast, we want to bring you an even closer look at what we're working on. Our mailing list subscribers will be the first to hear about any new games we're making, and will get access to exclusive deals on our original merchandise and inside looks at our studio. We're kicking off the Supergiant Blast later this month! Sign up by June 25 if you want to get the first installment. We've also updated each of our games on Steam to include quick links to our sign-up page. Beyond that, we've got a lot of exciting stuff in the works here these days! We'll be looking forward to telling you all about it in the weeks and months to come. Fresh from the Downside comes Ti’zo, the Nightwings' venerable drive-imp, and he would be delighted to have a warm and comforting new home. Especially if fish is a staple of your household diet. 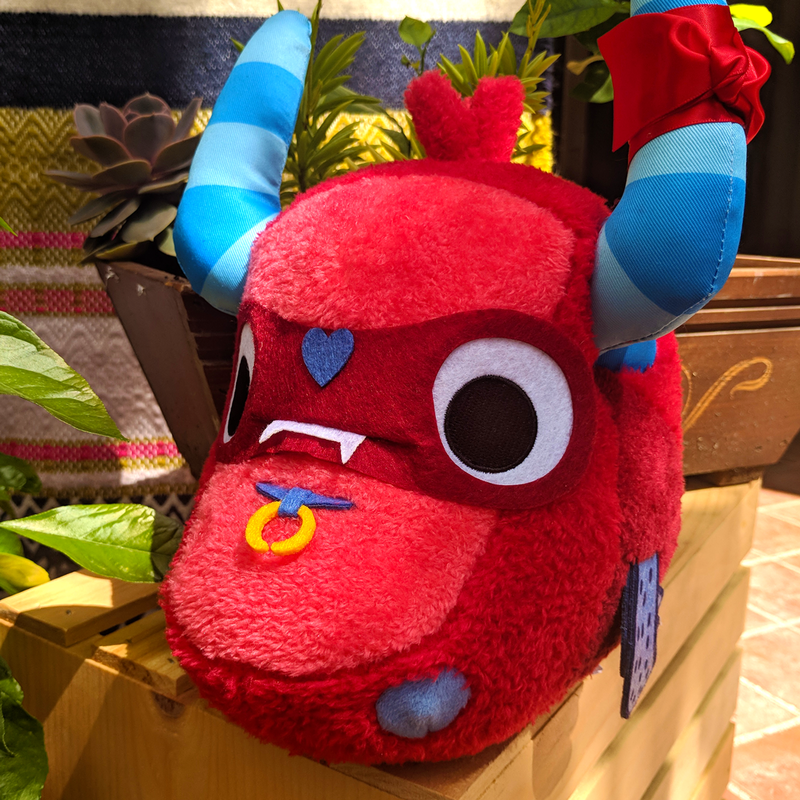 Adopt him for yourself at our online store. Ti'zo is finally here, and looking for a new home! 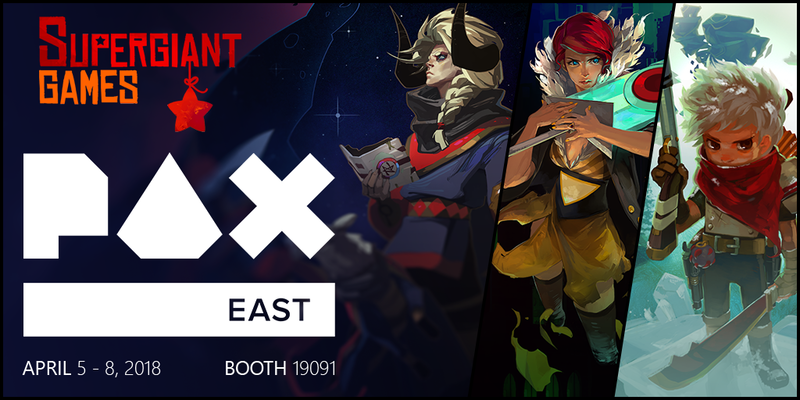 Folks attending PAX East 2018 this week can get him direct from us at our booth 19091. If you happen to be at the show, stop by our booth and say hi to members of our team! This will be our eighth consecutive PAX East! Update 18-apr-2018: Thanks to everyone who applied for the 3D character artist position. At this point we're no longer seeking new applicants. Should we have any additional job opportunities in the future, we'll post about it here and via @SupergiantGames. Our art team is growing! In addition to our 2D environment artist position, we’re seeking a 3D character artist to join us in the creation of various characters and creatures for our next game. This is a full-time contract position with the option for working remotely. We use 3D modeling to bring characters to life in our painterly worlds. Come help us create unforgettable characters! Model and texture high-definition characters and creatures under the supervision of the 3D art lead. Deliver on artistic / creative goals while adhering to production, gameplay, and performance requirements. Occasionally assist with marketing / promotional art, and additional art duties. Organized, responsible, and able to work autonomously. Strong familiarity with Supergiant’s titles; general interest in video games. Experience with 3DS Max, Maya, Mudbox and other 3D Suites. Ability to rig a plus. Knowledge of Python a plus. Experience and interest in traditional art a plus. We offer competitive compensation, flexibility in whether you work remotely or on site, and a collaborative environment where you’ll have many opportunities to make key contributions to our next project. What changes might you make to improve the visual experience of one of our past titles? Your power animal. What is it?! Please be aware that a paid art test may be requested as part of the evaluation process for the position. We will be accepting applications for this position until April 3, and will follow up with prospective candidates by mid-April. Update 18-apr-2018: Thanks to everyone who applied for the 2D environment artist position. At this point we're no longer seeking new applicants. Should we have any additional job opportunities in the future, we'll post about it here and via @SupergiantGames. Our art team is growing! In addition to our contract position for a 3D character artist, we’re seeking a 2D environment artist to join us and help make the worlds of our games more beautiful and atmospheric than ever before. This is an on-site, full-time position at our studio in San Francisco. From Caelondia to Cloudbank to the Downside, we've transported our players to a variety of vibrant worlds. We want YOU to help us keep us keep going! Collaborate with the Art Director to create shippable environment assets; from concepting, to painting and integrating into our pipeline, to final polish. Collaborate with Art and Design teams to ‘beautify' maps, levels, and environments in accordance with the creative goals and technical requirements; taking environments from graybox design to final quality. Assisting with marketing and promotional art. Occasionally take on additional art duties as necessary. Excellent environment art, with a strong sense of color and composition. Experience with beautification and environmental set dressing. Excellent digital art skills with an appreciation for traditional mediums. Love for environmental worldbuilding, able to execute on isometric tilesets. A distinct creative voice with ability to execute across a spectrum of styles. Effective at and open-minded about communicating, learning, and teaching. Effective at creatively and collaboratively problem solving. Must be proficient in Photoshop. Experience with map editing tools a plus. Benefits: Health, dental, vision, and 401(k). Generous vacation policy. Creative, open office in a great neighborhood. The Year of the Dog is off to a rollicking start for us here at Supergiant! We've got a couple of exciting new items plus a bit of news to mark the occasion. First, by EXTREMELY POPULAR DEMAND, we’re pleased to present the official Pyre Dog Hoodie. This high-quality garment is embroidered with the Eight Stars of the Rites, and sports the distinctive colors of the venerable Nightwings. Available in a variety of sizes. Visit our Pyre Dog Hoodie Store Page for more! Next is something that’ll be a real treat for any fan of Pyre's critically acclaimed musical score. The vinyl edition of the Pyre Original Soundtrack by Darren Korb is a triple LP set in a beautiful tri-fold jacket with original artwork by Supergiant’s art director, Jen Zee. Visit our Pyre Soundtrack Triple LP Store Page for more on that one! And stay tuned for more Pyre merch later this year. For good measure, right now you can pick up Pyre for 50% off during Steam's Lunar New Year Sale! We were happy to hear from many new players across the world over the holidays. We love hearing about your unique stories and relationships formed through the game. We’re looking forward to an exciting year ahead, and keeping plenty busy figuring out our next move. Our team's also been making the rounds these days since we're between projects -- for instance, Amir our studio director will be hosting a roundtable at D.I.C.E. on the subject of effective creative collaboration, and Camilo our 3D modeler and animation will be giving a GDC talk on building and animating characters in Transistor and Pyre. As for what's next for us, we promise to tell you all about it just as soon as we're ready! 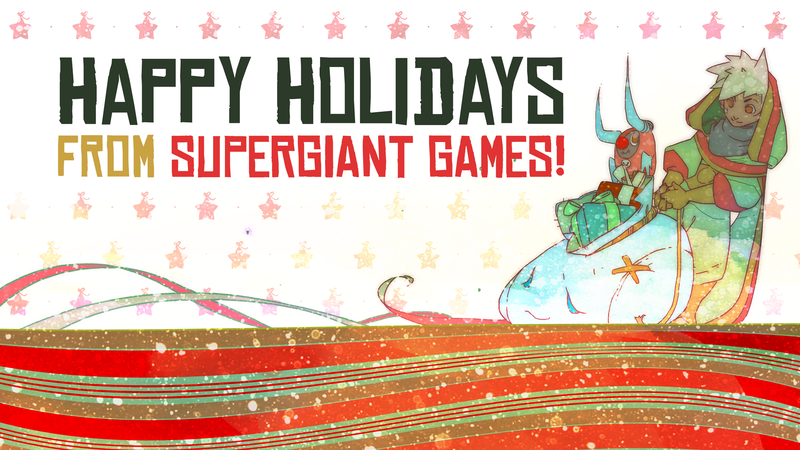 On behalf of all twelve of us here at Supergiant, we wish you a happy holiday season. Thank you for playing our games and for all your support! This was an important year for us, as we launched our third game, Pyre, after three years of development. If you or a friend haven't tried it yet, right now you can get great deals on all our games! Pyre on Steam (Windows / Mac / Linux) -- 50% off! Pyre on PlayStation 4 -- 50% off! Transistor on Steam (Windows / Mac / Linux) -- 75% off! Transistor on PS4 -- 75% off! Transistor on GOG (Windows / Mac / Linux) -- 75% off! Transistor on the App Store (iPhone / iPad / Apple TV) -- just $1.99! Bastion on Steam (Windows / Mac / Linux) -- 75% off! Bastion on PS4 -- 75% off! Bastion on Xbox One -- 40% off! Bastion on GOG (Windows / Mac / Linux) -- 75% off! Bastion on the App Store (iPhone / iPad) -- just $0.99! Pyre 'Black Magic' Art Print -- new item in our online shop! 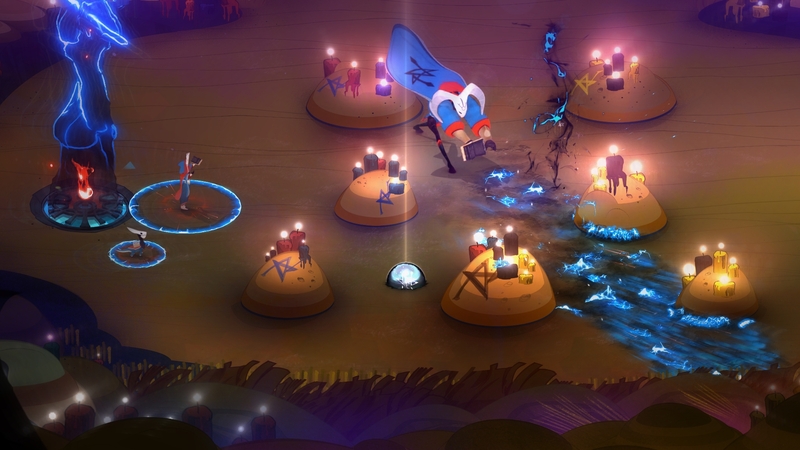 We want to make games that stick with folks in a positive way long after they're finished playing, so we're grateful to see Pyre come up for consideration at the end of a year that's been positively brimming with outstanding games. Pyre's success also means we get to keep going as a small independent studio, and keep doing what we love. Our foremost goal with each game we make is for it to do well enough that we can stick together as a team, and push forward in our quest to keep making games that spark your imagination like the games you played as a kid. We're grateful to have another shot at creating something like that, and excited to delve into the new year as we figure it out. We hope you'll join us for whatever we come up with next! 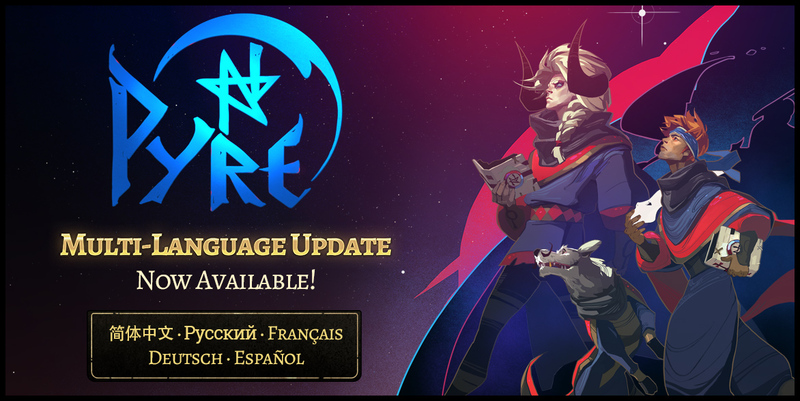 Pyre: ​Multi-Language Update Out Now! Pyre now features full text translations in simplified Chinese, Russian, French, German, and Spanish! This is an automatic update for the Steam version. The PlayStation 4 version will be updated in early 2018. We’re grateful to our players around the world for their patience and support on what we knew would be a much bigger and more complex translation project than we've done for our previous games. In addition to having a much larger word count than Bastion or Transistor, Pyre’s interactive narrative means there are hundreds of millions of possible content combinations to consider in the translation process. We hope this new update means many more of you out there will be able to fully enjoy our latest adventure. Thank you for playing Pyre!